Perfect for beginners of any age who want to make quick progress to coversational level. Possibly the fastest way to go from zero to conversational in Spanish. Don’t expect to get to fluency with this, but if your aim is to start forming your own sentences, rather than relying on a phrase book, or to get a good foundation for further study then you can make very quick progress within about a month with this. The 90 days of email coaching support is a nice addition. In 2006 I decided to take some time out to go travelling in South America. I was going to be away for around 9 months, mostly in areas where there would be very few English speakers. There was one big problem. At that point I hardly spoke a word of Spanish. I always hated languages at school. I did French and German, but was so disengaged I came away knowing very little, thinking languages just weren't for me. So I didn’t expect a lot from my ability of pick up Spanish. About a month before I went I was still procrastinating with the Spanish, when I came across an old book on learning languages through memory techniques, which really clicked with me. 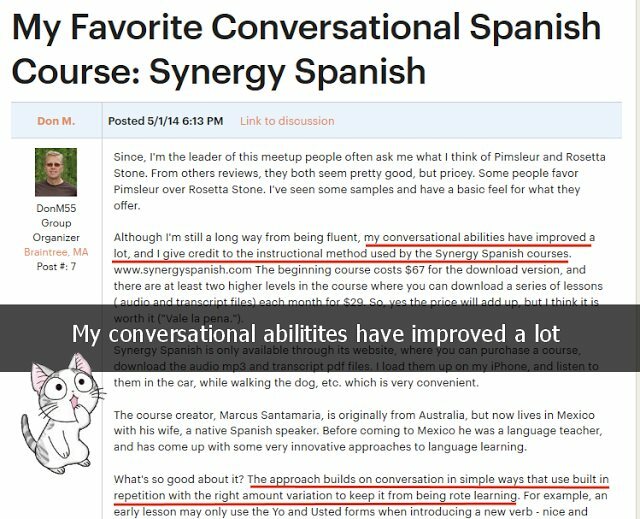 Inspired by that I found one specifically for Spanish that combined those techniques with very simple sentence building tips that let you communicate very quickly, without getting bogged down in grammar. Within a month, with very little focus on grammar, I knew enough to get by, and was amazed at how easy it was compared to learning at school. I always thought that you either click with languages when you are young, otherwise they are not for you, and it’ll be really difficult to learn later. I’m glad to say I was really wrong. This course really jumped out at me when I discovered it because it's based around a very similar method to the one I discovered. Synergy Spanish starts at the very beginning, so is suitable for absolute beginners. If you either tried to learn Spanish many years ago and didn’t get very far with it, or you are starting from scratch then this can take you from zero to conversational very quickly. Looking at their website it seems they are targeting the 40+ market, but I don't see why this wouldn't be good for adults of any age. I recommend it for anyone who might have written languages off many years ago, as well as people starting out for the first time. So what exactly is Synergy Spanish? Synergy Spanish is primarily an audio based course made up of 10-15 min audio lessons that take you from absolute beginner to conversational in about 24 days. The difference between this and other audio courses is its approach. The whole emphasis is on efficiency of words and phrases. Instead of learning grammar points and lists of categorised words like you do in school you learn carefully selected words that maximise your ability to say the most important things. It's actually based around a core of just 138 words that you can combine to say over 88,000 phrases. Just 138 words?? Hmm, I know more than that already! I must admit the 138 words claim they use does sound quite gimmicky – can you really speak conversational Spanish with just 138 words? Well, I think that’s missing the point a bit. The idea here is to have the best, most efficient foundation of sentence building words that you can build upon as you inevitably pick more up. So you may already know more words, but that doesn’t mean you can say as many actual conversational sentences as you could if you knew those specific 138. Think about it this way, in school you might have learned 10 animals, 10 items of clothing, 10 colours etc, but now try to make a conversation out of those? This will undoubtably teach you enough to get you speaking, meeting people, asking for things in shops and restaurants where you can add to those 138 words..
A screenshot from a user's write up on a Spanish forum. This is a written guide to the concepts in the course, including all the Synergy Verbs and Brick and Mortar words which allow you to build the sentences. This is the meat of the course. 68 audio (and video in the upgraded package) lessons in 10-15 minute chunks. Audio can sometimes be daunting for beginners but these are very well paced, building up in easy steps so they’re not overwhelming. They gradually add in more words and patterns that you can use with the ones you already know. Right from the first lesson you are building sentences of your own, rather than just repeating phrases word for word, which I find is really important to feel motivated and excited to progress with your language learning. I like the short length of these because it means that you have no excuse to not do at least one a day. Everyone has a spare 15 minutes a day. You can fit audio courses into your schedule without having to make extra time for them. I listen to audio them when I run, when I commute, when I cook etc, things I would be doing anyway. So they’re really time efficient. Obviously the more you put in the more you get out though, so you’ll always benefit from spending additional time on it. 3. iPhone, iPad, Android App. All the audio and video is available via a handy iPhone/iPad/Android app that lets you download the lessons as you need them, or in advance if you are going to be offline. There aren't a lot of visuals to show from an audio course app unfortunately! This is one aspect that sets this apart from most other courses. This isn’t a big company, it’s run by one guy, who is a Spanish teacher. If you get stuck at any point in the course then just drop him an email and he’ll help you out. It’s a personal touch that you obviously wouldn’t get with massive software courses like Rosetta Stone etc. I would like to say thanks for writing the course “Synergy Spanish”. I learned a lot of Spanish from your course; more than all my past classes. My Mexican friends are more than impressed with my progress in a little over a month!